Once you are registered you can file income tax return by using following steps. Step 1: Open the Income Tax website. At the right-hand side, you will find download menu. Under this download menu, you will find a list of ITR form for AY 2015-16. Download ITR Excel form applicable to you. To know which form is applicable to you refer to following section. 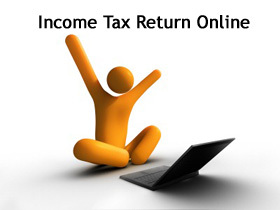 If Form ITR 1 or ITR 4S is applicable to you can quickly file income tax return online without downloading from. Step 2: Open Downloaded Excel based utility. The first thing you need to check is if macro is enabled or not. If macro is disabled kindly enable it. Fill up all applicable information. Green cells are for data entry and all fields with Red label are mandatory. Step 3: Fill up information in form after verifying from Form 26AS. Once you are done with filling all information click on “Validate” tab. Step 5: Generate XML file and save it on your computer. Step 6: Log on to Income Tax E-filing portal using your PAN number and password and go to e-file > Upload Return tab. Step 7: Select AY 2015-16 and upload saved XML file using browse button. If you have digital signature certificate you digitally sign this return. On successful submission, acknowledgement will be displayed. This year onwards you have an option to e-verify income tax return using Electronic Verification code (EVC) rather than sending acknowledgement by POST to CPC Bangalore. Once you submit EVC, the entire process of verification of your ITR is complete, There is no need to send a physical copy of ITR V.